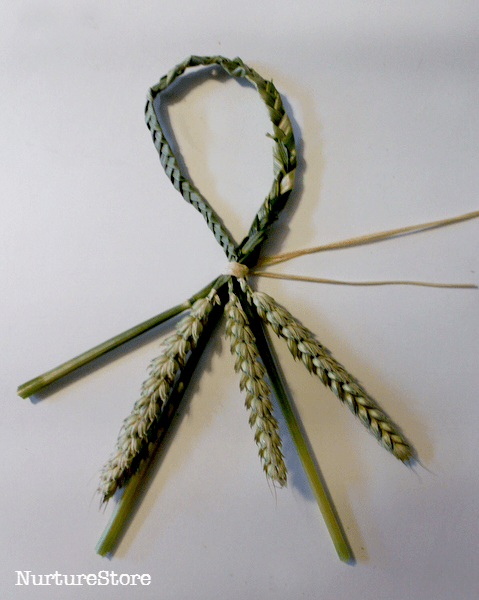 Reviving a traditional English craft, here’s how to make a corn dolly craft, perfect as a harvest celebration activity for children. I remember making corn dollies as a child for our school harvest festival. 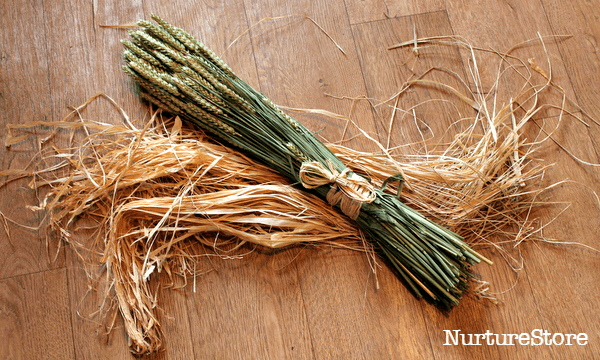 They are a traditional English craft (and across Europe), made using wheat, oats, rye or barley, and are associated with a celebration of the harvest. They were thought to give the Spirit of the Corn a home to live in over the winter, as the corn in the fields was harvested, and are used as decorations in harvest festivals. There are many different traditional designs, but here are three simple ideas that you can use to make corn dollies with children. We used wheat and raffia for our corn dollies. You can find online suppliers on both Amazon and eBay. They are lovely natural materials to use. The children really enjoyed working with them, and were interested to see flour in its original form. We have wheat fields near to us but this was the first time they had seen the crop close up. 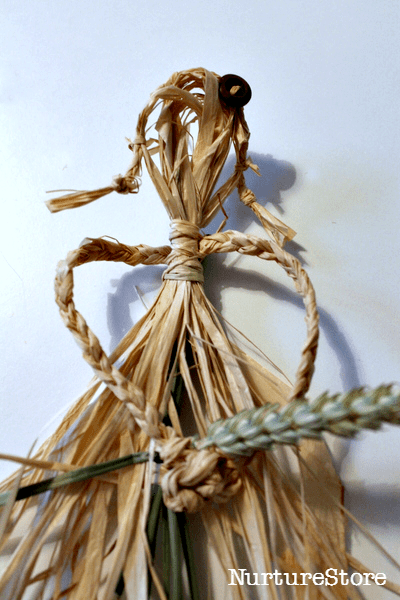 For our first simple corn dolly design, we used a plait. 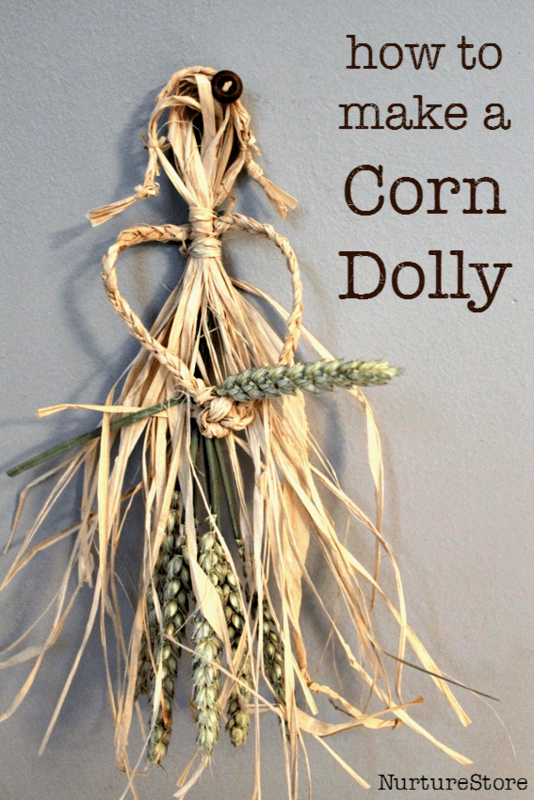 This is an easy way to make a corn dolly, so perhaps the best project for younger children. If you can plait (braid), you can make this. 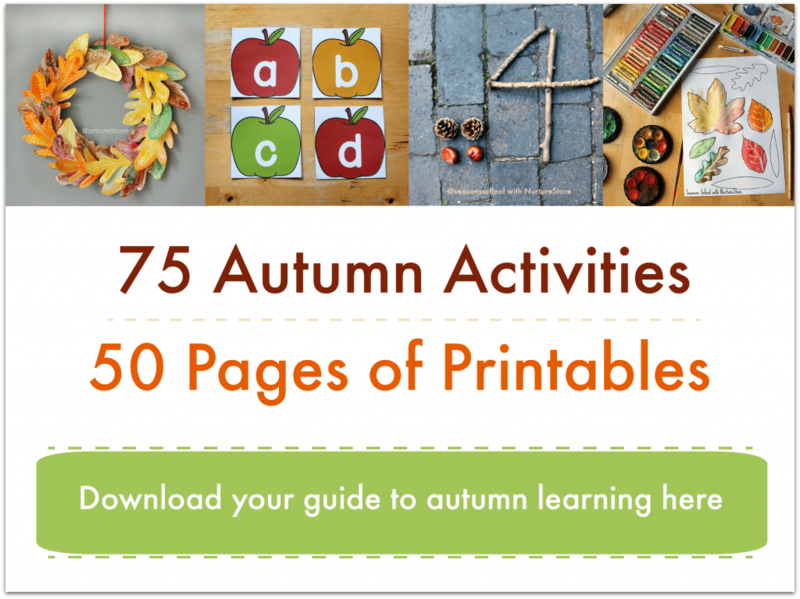 It’s a great workout for fine motor skills too. 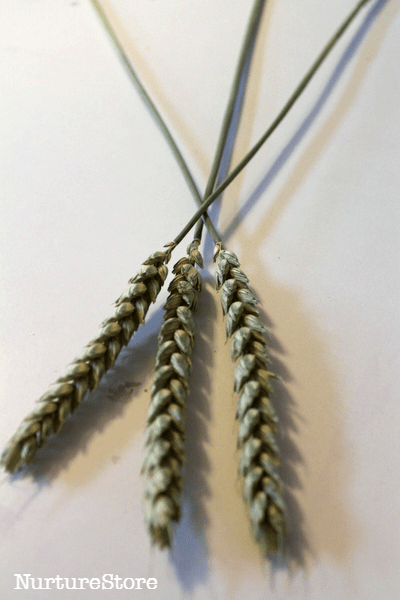 Then plait your wheat in the same way you would plait hair, bending the wheat stems over each other to make your braid. 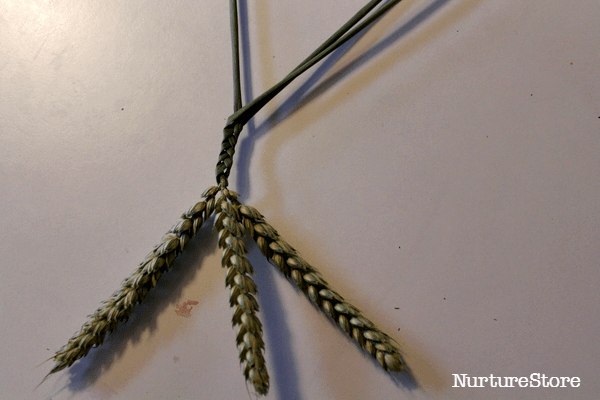 Keep plaiting along your wheat, leaving a section of each stem at the end so you will be able to tie your corn dolly. Top tip: you can use a clothes peg to hold your plait in place while you gather your materials to fasten it. Curl your plait around, and use a piece of raffia (or string) to tie it in place. 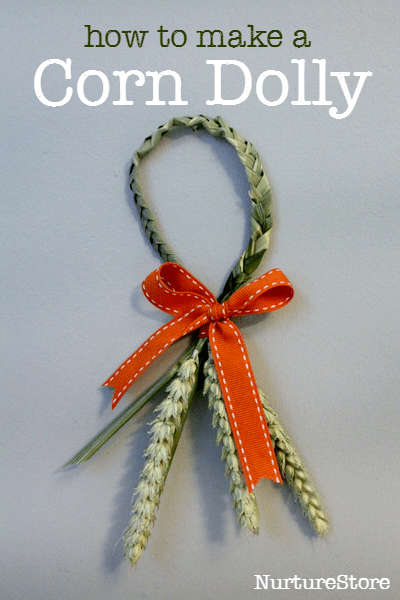 Cut the plain ends of your wheat to neaten them and then add a ribbon to decorate your corn dolly. 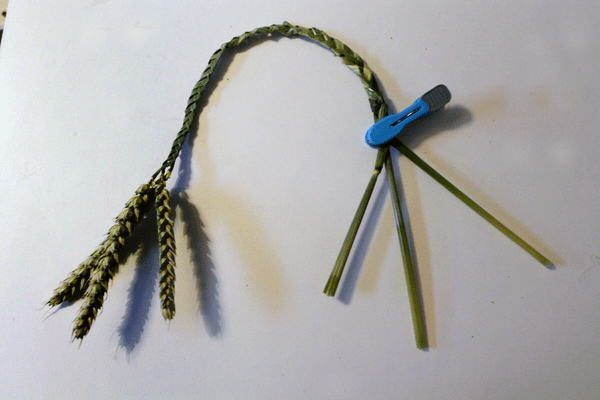 As a variation, you can use this same plaited technique to make a heart shaped corn dolly. Use six pieces of corn rather than three, and split them into two groups of three. Plait each group of three to make two braids. 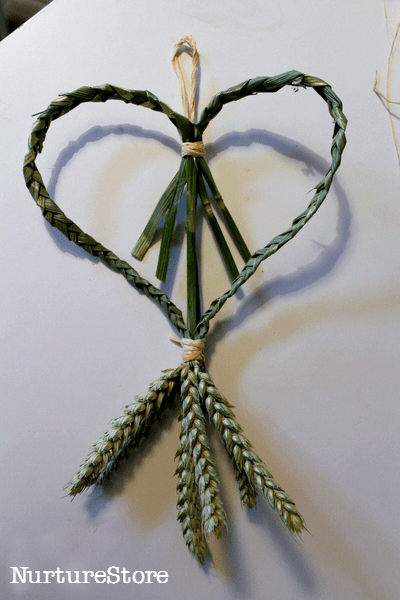 Bend each braid to form the two halves of a heart, and tie them in place with raffia as with the simple corn dolly above. You’ll see in the photograph below that one of the ends of corn stalk is tied into the bottom point of the heart shape. This helps to hold the heart design in place. 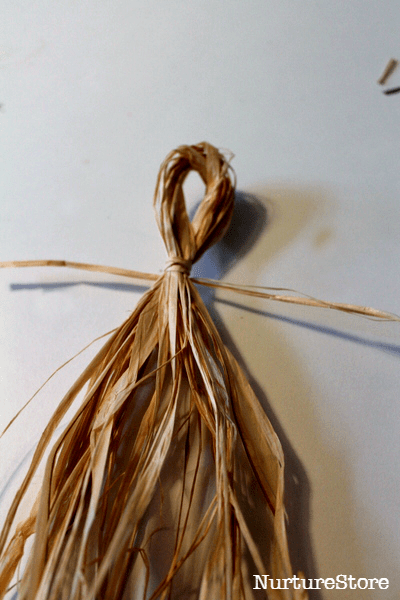 To make a corn dolly that looks like a figure, use raffia to make the head and body. Looping over the raffia creates the head, tied in place with an extra piece of raffia. A braid of raffia can be used to make arms, and then you can play around with the design and have fun adding hair, and other accessories: a button hair clip, some ears of wheat to add detail to her dress, or a piece of wheat for your dolly to hold to symbolise the harvest.